I have often said that baseball is a small world and this fact was illustrated again on our recent trip to Florida. 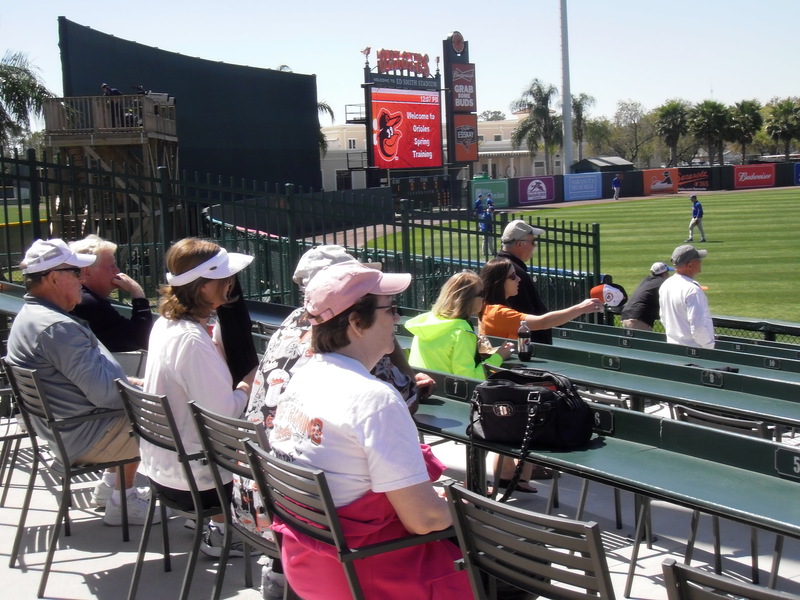 We were seated in left field at Ed Smith Stadium in Sarasota enjoying the game, surrounded by a variety of fans from all over the country. A few were even from Florida. A contingent associated with the Puerto Rican World Baseball Classic team was seated several rows in front of us. About the 6th inning or so, one of these young men rose and made his way towards us. I wasn’t really watching him and was startled to hear, “Austin; do you remember me?” It was Richie Gonzalez, who was New Market’s second baseman in 2009 and is featured prominently in Safe at Home: A Season in the Valley. We exchanged pleasantries and am happy to report that Richie is now coaching in Puerto Rico. Yes, that’s an actual bobble head. Along about the bottom of the 7th, a couple sat down next to us and the lady turned and said, “You guys did the video last year at Twin Lakes Park. 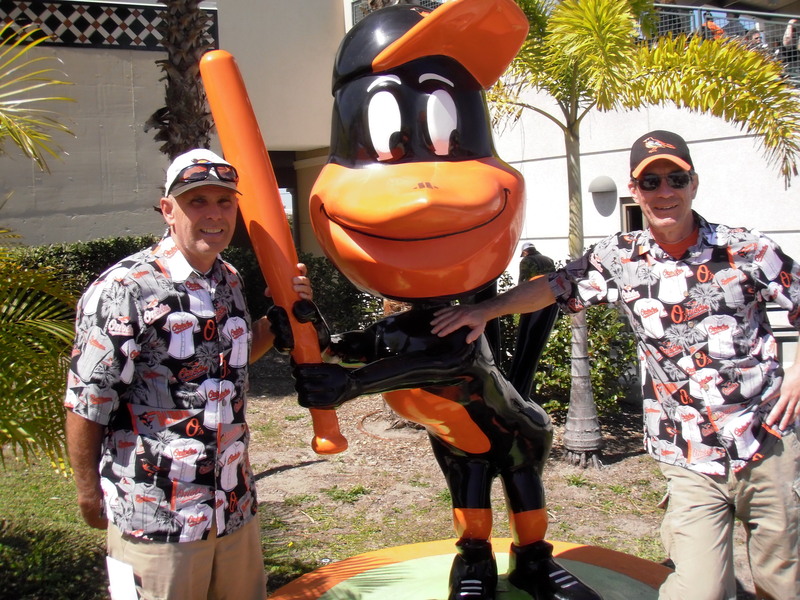 We saw you earlier and recognized your shirts.” I’m not sure why she would have remembered us from our shirts–judge for yourselves from the photo–but she was referring to Episode Two of Off the Beaten Basepaths and we certainly remembered talking to her. It was a fun trip all around and in addition to seeing the Orioles defeat Toronto 11-10 on a 3-2, 2 out, 3 run homer by Ryan Flaherty in the bottom of the 9th (an omen, I believe) we also saw the University of Florida defeat the University of Indiana in Gainesville, and the Phillies defeat the Astros (just as everyone else will this season) in Kissimmee. Another highlight, which was actually non-baseball related, was eating fried gator at Gator Joe’s Bar and Grille in Ocklawaha right on Lake Weir. Gator Joe’s is about 300 yards from the hide out where federal agents shot it out with the infamous Barker Gang in 1935. The biggest highlight of the trip, of course, was spending a week with Al and Margo Smith in their beautiful new home in Stonecrest. Good thing they like company because they’re going to be seeing quite a bit of us in the future! Considering that as I write this, the weather people are calling for up to a foot of snow starting tomorrow, you may want to venture to Florida in spirit by viewing the photo album of our trip. I think Ryan Flaherty hit that 3 run homer in honor of Earl Weaver. I was watching that game, and was looking for you & Al, but didn’t see you. I thought for sure they would have recognized & interviewed the two most famous fans in the ballpark. I am certain that Martha was thrilled having you wear that shirt again! As far as the weather goes, I hope you brought back some of that Florida sun for April 6th! Martha was indeed thrilled and wants me to wear that shirt more often. Clearly, we failed to bring back any warmth and sunshine, although we tried! I LOVE the photo of “the two cuties” in the matching shirts with the bobble head. Looks like you were having a good time — and that’s what it is all about! A good time indeed, Bonnie! And yes, we are cute. Luau Night is coming at the end of April to Social Graces. I might have to break out the shirt for that occasion. Jerry should try to find a Brooklyn Dodgers version. Who knows, maybe Frank Shelley (Pentagon Monster) might show up in his Luau shirt! Don, you have a good memory. Frank certainly won’t be at work! It was indeed a great week. Margo and I looking forward to your next visit and the sooner the better. Thanks, Al. We can’t wait!